GIGABYTE launches a new promotion this summer. 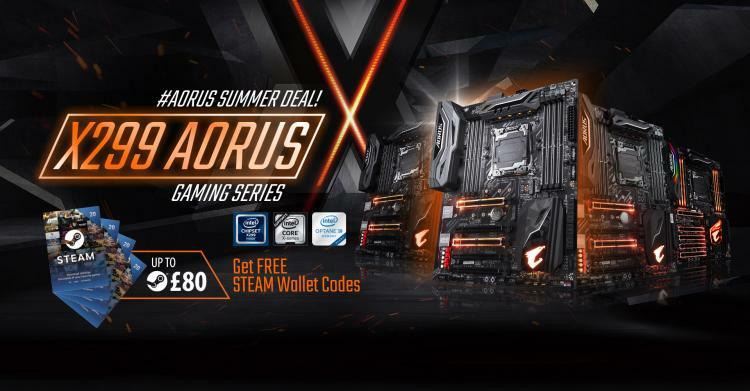 Purchase any of the new GIGABYTE and AORUS-brand X299 motherboards for the new Intel Core-X processors and receive FREE Steam Wallet codes of up to £80. Steam Wallet codes can be redeemed on any personal Steam account as credits which work like gift cards. The credits can be used to purchase software, games, game content and other purchasable materials or content found on the Steam store. With this promotion, GIGABYTE is offering X299 builders the chance to grab the newest game titles and game content go to along with their high-end desktop build or upgrade. This GIGABYTE AORUS X299 Motherboard Summer Deal starts on the 26 of June until the 31st of August 2017, or until supplies last. This Promotion is open to residents of United Kingdom and Ireland only. Purchases of qualifying products and corresponding claims must be made in the country of residence. Check out where to buy GIGABYTE AORUS X299 motherboards here. To submit a claim, the GIGABYTE customer must fill in and submit the official registration form at http://gaming.gigabyte.eu/Intelmotherboard/Steam/x299/UK.aspx within (30) days from the original purchase date of the appropriate GIGABYTE AORUS motherboard. GIGABYTE consider the date of dispatch to count as day one of the purchase date and registration period. Read complete teams and condition of the promotion here.